Many Thanks for visiting Colchester Fine Art Picture Gallery and I do hope you find a painting, etching, engraving or print of your choice that inspires you enough for you to purchase and make it your own. COLCHESTER FINE ART offers an ART VALUATION SERVICE, for information and to access this service please look at the pages index on the right side of this page and click on Art Valuations. WE ARE VERY SORRY BUT DUE TO THE STUPID NEW E.U. VAT REGULATION IN FORCE FROM 1st JANUARY 2015, which now affects small businesses we will NO LONGER SELL TO ANY E.U. COUNTRY. Countries outside the E.U please EMAIL OR PHONE FOR ENQUIRIES ON PICTURES, ETC. FOR THE CORRECT POSTAGE TO YOUR COUNTRY. PAYMENTS MUST BE MADE IN BRITISH POUND STERLING, (GBP.) ONLY, SMALL AMOUNTS CAN BE PAID THROUGH PAYPAL AND LARGER AMOUNTS MUST BE PAID BY BANK TRANSFER. Many Thanks for your kind help with this situation. Colchester Fine Art uses a professional World Wide shipping company for packing and shipping most pictures overseas, please contact for information. 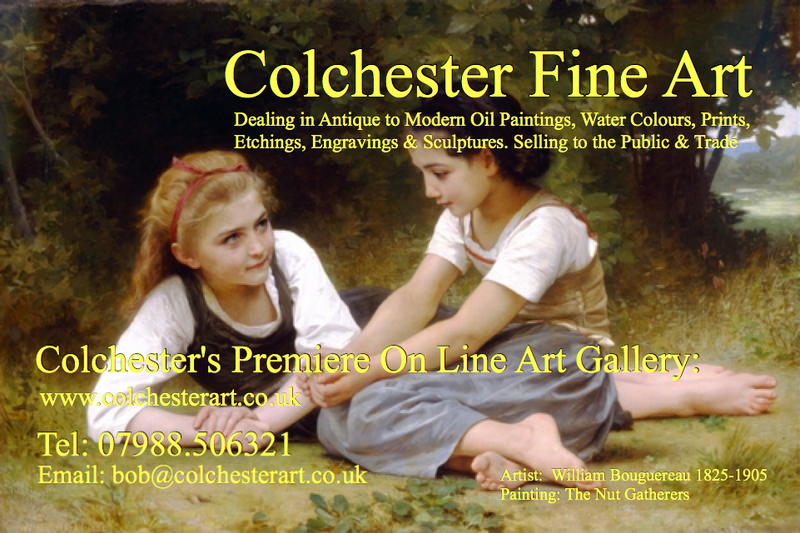 COLCHESTER FINE ART, The Home of Affordable Art, wishes you well and want’s you to enjoy browsing this Art Gallery in search of your painting, print, etching or engraving. Please take your time and “HAPPY BROWSING”.